Here’s a rather surprising findings by Nielsen which debunks the myth that TV is on its way to extinction in favor of the Internet and mobile phones. According to Nielsen’s report, Americans have in fact increased their overall media usage and media multitasking activities by using TV simultaneously as they connect to the Internet and use their mobile phones. The Nielsen report called “Three Screen Report” tracks consumption across TV, Internet and mobile phones. The report showed that in the last quarter of 2009, TV consumption and Internet use combined have reached three and a half hours monthly. This is a 35% growth from the third quarter of 2009. 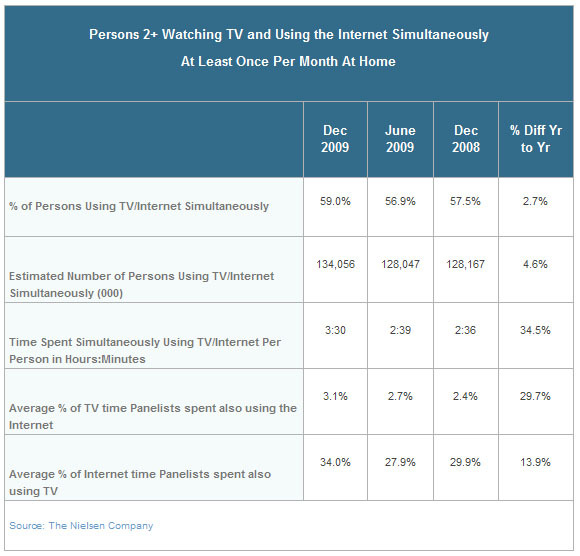 In addition, 60% of TV viewers are watching TV while using the Internet at the same time. Nielsen Company media product leader Matt O’Grady says that using the Internet while watching TV have given TV viewers a unique on-screen and off-screen relation with TV programming. “The initial fear was that Internet and mobile video and entertainment would slowly cannibalize traditional TV viewing, but the steady trend of increased TV viewership alongside expanded simultaneous usage argues something quite different,” said O’Grady. The study also found that on the average, Americans watched 35 hours of TV per week and two hours of timeshifted TV via DVR. This is attributed to the fact that DVR provides them with added convenience. At the same time the growth of HD programming and flatscreen TVs have also contributed the renewed interest with watching TV programs. The availability of more channels and choices due to digital delivery be it via cable or satellite are also contributing factors. Other findings of the study include – increase in online video consumption as well as increase in the active mobile video users courtesy of the booming smartphone market.